FitnessSyncer Uploader is an application you can install on your Windows or Mac desktop to automatically upload your health and fitness information into FitnessSyncer and can then be automatically uploaded into services like Strava. It is useful for devices such as Garmin’s, Timex, or Magellan which store their data on your hard drive. 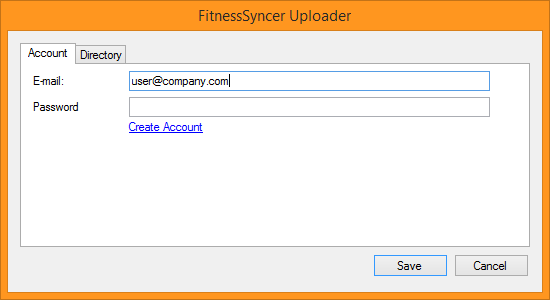 After installing the application and starting it up, FitnessSyncer Uploader will bring up its configuration screen. Enter in your e-mail address and password associated with your FitnessSyncer account and under the Directories tab, enter in one or more directions where your GPX, TCX, KML, KMZ, PWX, or FIT files are stored. For example, for Garmin devices, use the folders mentioned here. Once saved, FitnessSyncer Uploader will automatically scan the directories and all of their subdirectories and upload the content to FitnessSyncer Notebook where you can see it in the Stream, Dashboard, or push it to another service using a Sync Destination Task. While we do support CSV files of your activity from Cloud Storage providers or E-mail, we do not support them from the FitnessSyncer Uploader.